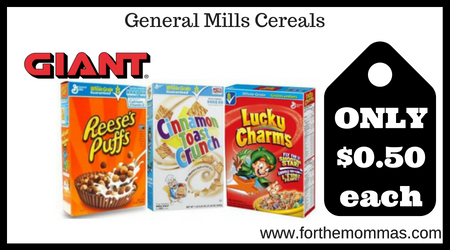 Giant: General Mills Cereals ONLY $0.50 Each Starting 8/17! Starting 8/17, Giant will have General Mills Cereals for $2.50 each. Score an instant discount to further reduce the price. Plus, stack a few General Mills coupons to make the final price JUST $0.50 each.